When Is An Expiration Date NOT An Expiration Date? On Your Passport! 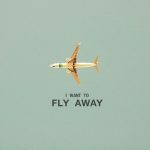 Recently, I have read several articles and blog posts about people who were refused boarding at the airport because their “documents” were not in order. In particular, several of these people had passports that still had several months remaining until their expiration date. Who would ever think that it would be a problem traveling with what by all rights appears to be a valid passport? 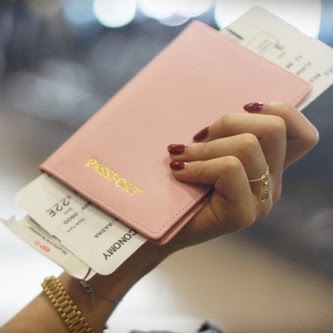 Lo and behold, many countries including all of the European Union nations and Mexico, require your passport to be valid three to six months beyond your travel dates. 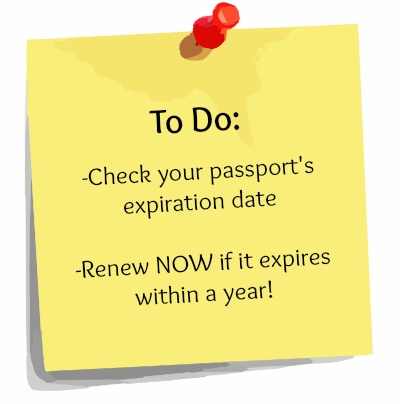 Do not let your dream vacation be ruined because your passport has effectively expired…do yourself a favor and renew it early! Very Important Travel Tip!!! 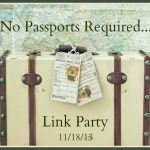 Check Your Passport Expiration Date! It would be nice to have an app for all of one's ID's and Passport – that would ding or remind one of expiration dates. I know many friends who have arrived at the airport all ready for a vacation, and then to be stuck because of expired Visa's and Passports. Great reminder, as I have heard some horror stories of long planned vacations coming to an abrupt halt due to this very issue. I try to keep our passports up to date all the time since we love to travel and luckily, never had this problem yet. Good reminder for everyone Sandy! Wow, I didn't know that, Sandy! Thanks for the tip. We just renewed our passports a couple years ago (boy do I hate my photo), but I'll definitely remember this for when it comes time to renew. I have to admit, I've had to do a "rush" on my passport renewal before. I had no idea about the expiration date not really being an expiration date. It's these little gems of insight that make you such a valuable resource for your readers! Thanks for watching out for us! I know several people that this has happened too, as the passport was within the 3 month window. Thanks for the reminder, this is excellent information! I had no idea! Mine expired, and I had in renewed before it was a problem. I hate my passport photo, of course. Sandy…I know this all to well and you are so smart to bring this up on your blog. I have "squeezed" my kids thorugh some countries, not realising that with six months to go before expiration that we are walking a very fine line. Fortunately for us we have two passports. If one does not work, we pull out the other. Some countries are stricter than others…best to be prepared not matter where you travel too! Wow, Sandy, I had no idea. What great information, because I would certainly think my passport was valid until the expiration date! Thanks for the info!! I know I need to get a new one! You are so great Sandy; you help us pack our bags and get all the details out for us! THANK YOU! Thanks for the wise words, Sandy. We are going on a cruise this summer and I am going to check the dates on the passports as soon as I find them. YIKES!!! Such a great reminder! 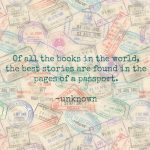 After reading Stacey's post at Quintessence, I immediately went to check our passports. Good news….we're good to go!!! I renewed mine before Christmas because it didn't have six months left on it. I'm sure many people are not aware of the strict rules and will appreciate your post.